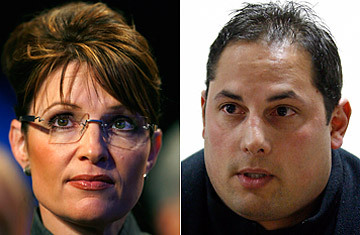 Alaska Governor Sarah Palin and Alaska State Trooper Mike Wooten. Does Sarah Palin Have a Pentecostal Problem? Friday's report from special investigator Stephen Branchflower to Alaska's Legislative Council answered some basic questions about the political and personal bog known as Troopergate. Was the refusal to fire Mike Wooten the reason Palin fired Commissioner of Public Safety Walt Monegan? Not exclusively, and it was within her rights as the states' chief executive to fire him for just about any reason, even without cause. Those answers were expected, given that most of the best pieces of evidence have been part of the public record for months. The result is not a mortal wound to Palin, nor does it put her at much risk of being forced to leave the ticket her presence succeeded in energizing. But the Branchflower report still makes for good reading, if only because it convincingly answers a question nobody had even thought to ask: Is the Palin administration shockingly amateurish? Yes, it is. Disturbingly so. The 263 pages of the report show a co-ordinated application of pressure on Monegan so transparent and ham-handed that it was almost certain to end in public embarrassment for the governor. The only surprise is that Troopergate is national news, not just a sorry piece of political gristle to be chewed on by Alaska politicos over steaks at Anchorage's Club Paris. A harsh verdict? Consider the report's findings. Not only did people at almost every level of the Palin administration engage in repeated inappropriate contact with Walt Monegan and other high-ranking officials at the Department of Public Safety, but Monegan and his peers constantly warned these Palin disciples that the contact was inappropriate and probably unlawful. Still, the emails and calls continued  in at least one instance on recorded state trooper phone lines. The state's head of personnel, Annette Kreitzer, called Monegan and had to be warned that personnel issues were confidential. The state's attorney general, Talis Colberg, called Monegan and had to be reminded that the call was putting both men in legal jeopardy, should Wooten decide to sue. The governor's chief of staff met with Monegan and had to be reminded by Monegan that, "This conversation is discoverable ... You don't want Wooten to own your house, do you?" Monegan consistently emerges as the adult in these conversations, while the Palin camp displays a childish impetuousness and sense of entitlement. One telling exchange: Deputy Commissioner John Glass, who worked under Monegan, told Branchflower he was "livid" after a Palin staffer, Frank Bailey, went outside the chain of command and called a state trooper in far-off Ketchikan to complain about Wooten. Why had Bailey called the trooper? Because, Bailey said, this trooper had gone to church with Sarah Palin back in Wasilla, so he felt "comfortable" talking to him about Wooten. Glass, too, tried to sound the warning that continuing to pressure anyone and everyone in the matter would end in "an unbelievable amount of embarrassment for the Governor and everybody else".